There have been a number of excellent albums this year but for me this one is by far the best of the bunch. The newest album from Swedish heavy metaler Peter T's industrial metal band Pain has an excellent balance of computer generated sound and full-on rock/metal. Although this album does deliver a softer (less metal) sound then its predecessors it keeps the basic sound of a Pain album while showing that the band is willing to expand its sound. 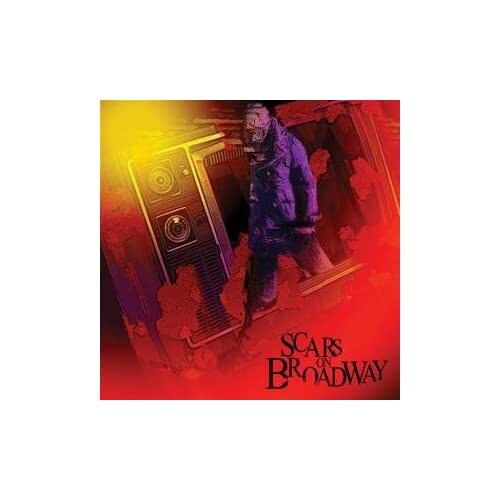 Daron from System of a Down's side project Scars on Broadway has continued to be on high rotation on my iPOD since it first came out this summer. The arrival of this album has proven once and for all that Daron can make it as a lead vocalist as well as the writer and creative force. Its just unfortunate that he cut off the tour in support of this album thus preventing any remote chance of them coming to the Peg. Swedish death metal band Amon Amarth's newest album has pretty much solidified the fact that they can continue to deliver quality albums one after another. They once again delve into a world of Norse mythology and deliver a tight compilation of catchy melodic sounding songs with interesting and funny lyrics. With the arrival of emo and screamo bands over the last few years I have drifted farther and farther away from the Punk genre only really staying with the main bands that I started with in the 80s/90s. 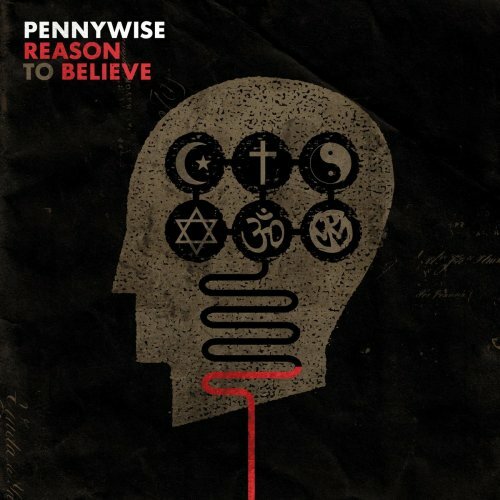 Pennywise has been known for bringing out the same sounding album every year over the last few years but this time around have brought something new to the table. I think they're pretty much completed exactly what they've been trying to do; release a punk album that doesn't sound stale or rehashed. I never really thought that I would ever been into an Opera but this Metal Opera double album has made me a believer. If they released an Opera that was written from this album I would be in the front row. 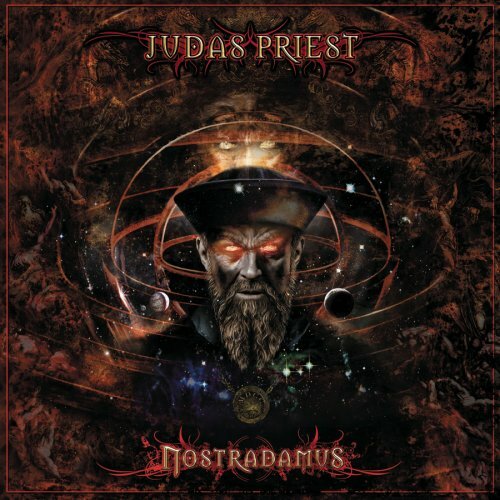 Although lagging in some parts this album is one of my all time Priest favourites. Just when you thought they couldn't release an album that sounded worse than Splinter they release this Bob Rock-produced monstrosity. If their goal was to release the next Coldplay album then they succeed as the songs have been so overproduced that they sound like they were written by the record company themselves. Well Team t-Lo had another wonderful Christmas this year. It all began about a month ago when Terry and I decided that we would take Logan to the Toys R Us to wonder around. 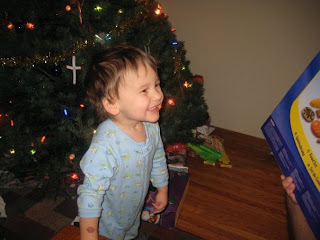 Then we would know what toys Logan really took a shine to and get them for his birthday and Christmas and tell Santa what kinds of things our boy was interested in. While at Toys R Us, we were checking out the dinosaurs when Logan spied something that would keep his attention for the rest of the trip. A kid sized laptop! He loved that thing. He wouldn't stop playing with it. Terry and I wanted to move on to look at the other toys, but Logan wouldn't budge. 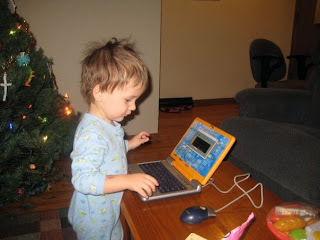 So we did the classic parent thing and told him that if he was good Santa would bring him the laptop for Christmas. It sort of worked. He did permit us to wonder throughout the rest of the store. 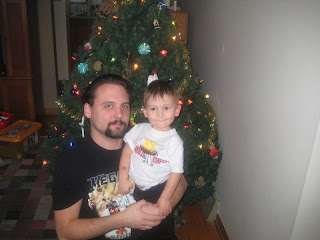 From then on anytime we talked about Santa, Logan would say "laptop?" 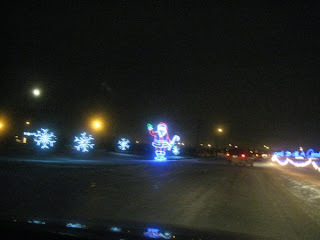 Apparently this Santa character was only good for one thing - bringing laptops to good little children. Finally Christmas morning came and there were so many presents to open. Logan loved them all. He started with his stocking which held his very favourite candy - Swedish Berries! Yum Yum! He got cooking utensils and plastic food, books, clothes, Hot Wheels, a tool set, a tractor, fridge magnets and all sorts of other things. What a spoiled yet very good little boy! Of course, we saved the best for last. 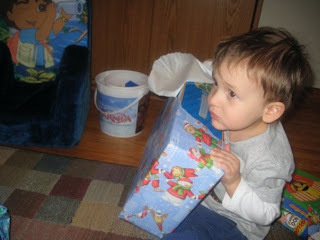 Although by that point Logan was getting a little discouraged about opening presents. 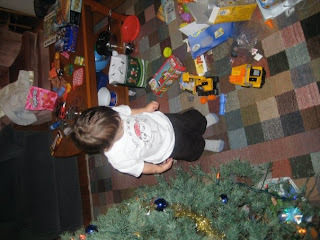 He wanted us to actually open the boxes and let him play with all the stuff he'd already unwrapped. We almost couldn't get him to open the final box. But when he did, it was all worth it. A Laptop! We set the laptop up beside our computers and let him play. At first it was cool because Logan is very good at his letters. He figured out how to get the laptop to repeat the letters he was typing on the keyboard (the thing sports a full sized keyboard just like mommy's and daddy's). But then he started to realize that this laptop couldn't send messages to daddy's Blackberry, or play Doom, or make music videos appear on the TV screen like the other computers in the house. So he went back to playing on Daddy's computer mostly. He still turns his on to hear the beeps and boops. Hopefully he'll grow into it and be able to play the games a little more soon. After all that excitement there was one heck of a mess to clean up. But we didn't mind. 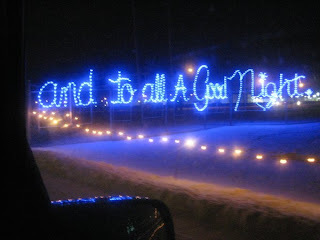 That is what Christmas is all about. 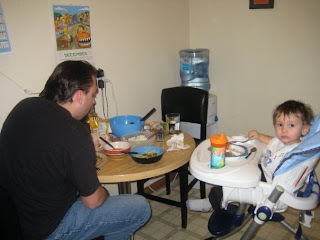 Then we started on the Christmas dinner. It was delicious. This is the first time I attempted to make stuffing that wasn't Stove Top. It turned out wonderfully in the crockpot. My boys enjoyed turkey, stuffing, gravy, veggies, potatoes and gingerbread cookies for dessert. Happy Holidays from Team T-Lo! 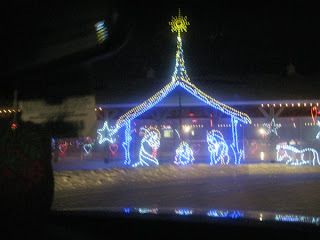 Not only did we put up the tree this weekend, but we also went to see the Winter Wonderland light display at the Red River Exhibition grounds. 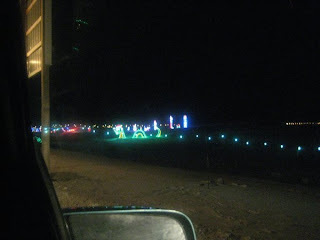 It was a beautiful light display. 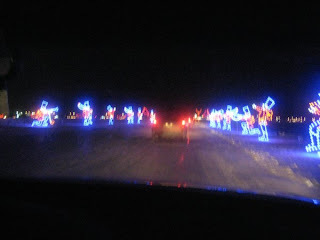 Even though it was a long drive for us near Logan's bedtime, he stayed up to enjoy all the pretty lights! 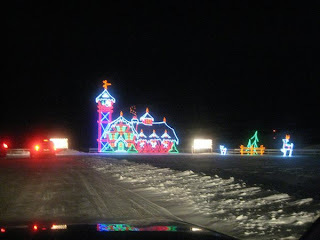 The following is a bit of the light show in picture form. 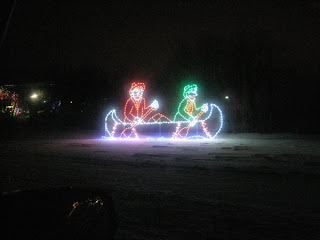 I recommend that if you're in the Winnipeg area that you should go see it in person though. It's quite spectacular! 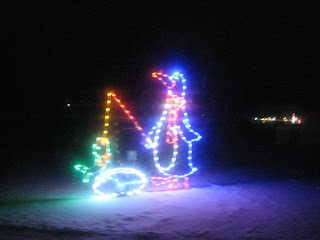 A penguin ice fishing - wha?!!! One of Logan's favourites - the Loch Ness Santa monster! Santa bidding us goodbye at the end of the parade of lights. 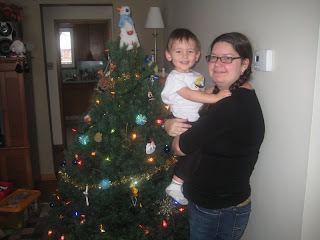 Well technically it's Logan's second Christmas tree, but he was only a few days old when we had the other one. We decorated it the day before he was born in fact. On December 11th Logan turned 2! He's such a big boy. He's grown so much this year and he's learned so much. He's growing up way too quickly for my taste! Just comparing to last year, there is so much of a difference. Logan had a great day. We decided to keep the confusion down by not having a big party this year. He wasn't sure exactly what a birthday entailed and he still gets it a little confused with Christmas. So it was just him and his parents on the evening of his birthday. First we opened presents. He soon got the hang of that! Here he is opening a train set from his cousins Caitlyn and Devin. 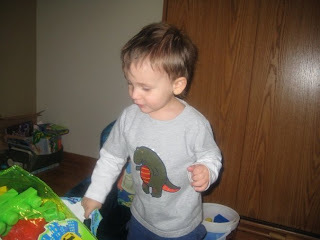 Here he is opening his MegaBloks from mommy and daddy. 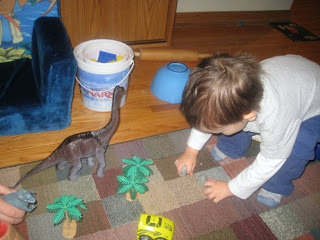 Here he is playing with his big tub of Dinosaurs from Grandma and Grandpa. 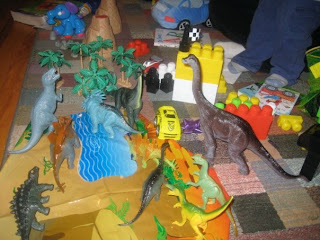 Here is Blok and Dino jungle in it's full glory! Then it was time for cake. Logan knew all about cake because it was my birthday only a few weeks ago. 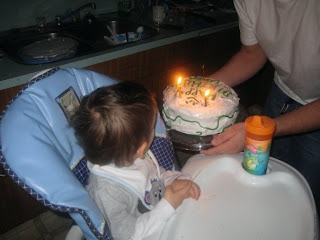 He was eagerly anticipating blowing out some candles. I made a plain white cake (so it would taste like the ones you buy at Safeway) and some nummy icing that tasted like marshmallows. The cake was a little mangled since I have no clue how to decorate a cake, but I got Logan's name on it and it sure did taste great! Logan successfully blew out his candles with a little help from daddy. And now we may move on to celebrating Christmas without causing our toddler any undue confusion. 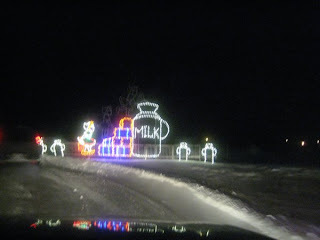 We're going to get our tree today and possibly head out for a tour of the lights!